Got an 8th-grader at home? You must be in the throes of high school admissions, sorting out your selections and visiting schools. 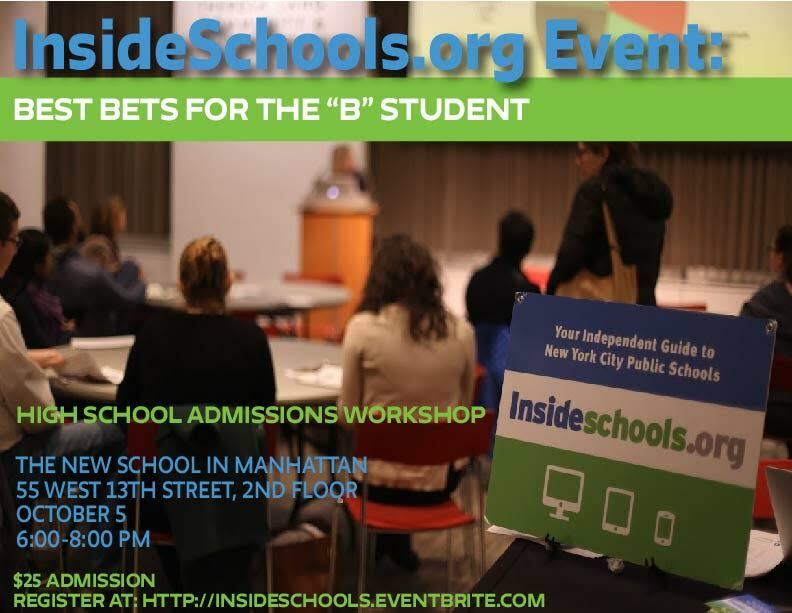 Our advice: Take a deep breath, check out our tips for making the most of your high school search and register for our final fall high school workshop, "Best bets for the "B" student", Wednesday, Oct. 5 from 6-8 pm at the New School in Manhattan. Everybody hears about the tip-top schools, the ones that accept only “A” students and ace testers. But what about the student who earns average grades? What are some good high school options for the "B" student? Join Clara Hemphill and the InsideSchools staff for a panel discussion designed to help you sort out your options. We'll give you our picks and provide you with an informed list of choices. Got other high school admissions questions? We’ll tackle those too.